The Mach® 9 is a high speed coin processor suitable for high volume processing centres where throughput and reliability is paramount. The Mach 9 is the perfect solution for financial processing centres, vending and transportation organisations and gaming houses. Highly configurable, the Mach 9 can track and consolidate management information, eliminating the need for manual reporting. Optional coin WAVE authentication provides an additional layer of security and precise count assurance. The patented Figure 8 technology provides optimal and accurate counting and sorting at up to 4,500 coins per minute. This makes Mach 9 one of the fastest in its class. With nine sorting positions the Mach 9 can assign more than one sorting position to a single denomination maximising run time. 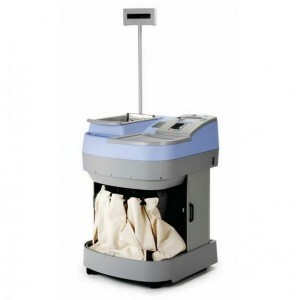 Denomination and volume dependant, the Mach 9 can be equipped to dual bag up to four denominations. Throughput is the truest measure of productivity and can only be achieved when a coin processor runs uninterrupted. The Mach 9’s patented sorting system ensures trouble-free operation and unrivalled performance. The standard Management Information Control System (MICS) provides three levels of memory and allows other media, such as cheques, vouchers or bulk coin to be entered via the keypad. Notes can be entered manually or automatically transferred if a note counter is interfaced, ensuring a comprehensive audit trail.